After meticulously reviewing the schematic and the layout, and correcting all DFM issues, the boards have finally been sent out! Everything looked good, however the PCB manufacturer did warn us about pushing the limits of their plating capabilities with the 3mil annular rings we used for the 8mil vias. We followed most good engineering practices so we have high hopes the first revision but in the end only plugging it in will tell how well it turned out. 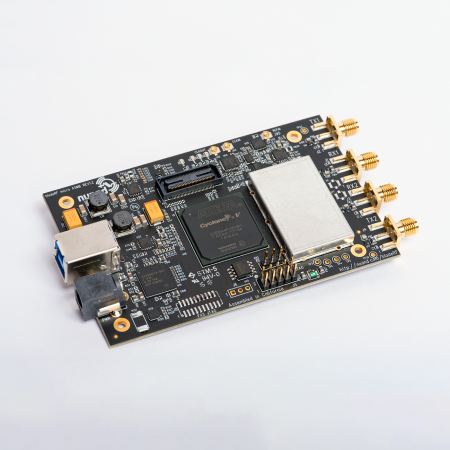 Software defined radios (SDRs) are a popular topic amongst amateurs, novices and professionals in the radio field. They’ve been around for quite some time, and, in the last 10 years, have become significantly less expensive and increasingly available. Recently, an inexpensive DVB-T / FM radio USB receiver dongle (RTL2382U) was found to supply raw complex samples when put into FM mode. Their software driver was doing the signal processing required to demodulate the signal to produce the audio. The dongle hardware was only being used as a tuner and Analog-to-Digital Converter (ADC). Moreover, the front end of the device, which does the RF tuning and downconversion, was found to cover a much larger frequency range than expected; approximately 60MHz – 1700MHz. It was then apparent that the dongle wasn’t just a DVB-T and FM receiver but one that could receive anything within the sampling bandwidth of the device with the right software. The device is capable to tune and receive FM, GPS, GSM, pagers, ADS-B, AIS, P25 and TETRA just to name a few. Unfortunately, therein lies the rub. Given the length of time SDRs have been around, there seems to be very little end user software produced. For how popular the RTL-SDR is, very few tutorials and general knowledge transfer happens with regards to how to demodulate and decode these transmissions. We hope to change that. We hope to ride the experimenters wave of Makers and Hackerspaces to help make software radio significantly more accessible to people who never even knew where to start. We have created bladeRF, a modern and inexpensive software defined radio, to help amateurs, novices and professionals alike. The world is mostly wireless and is becoming more so. We feel obligated to share our knowledge with everyone who wants to learn. Welcome to your software defined wireless world. I think you’ll like what you find here.